Stone, stucco and brick details combined with an open floor plan enhance this charming sophisticated, contemporary small stone cottage house plan. 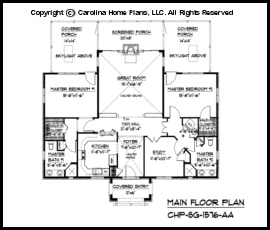 Featuring a vaulted ceiling great room, 9' ceilings throughout and split bedroom layout, this 2-bedroom (dual master suites), 2-bath small home floor plan is ideal for a vacation, down-sizing or starter home. The large kitchen boasts plenty of cabinet space as well as a lunch bar open to the great room with a floor to ceiling stone fireplace. 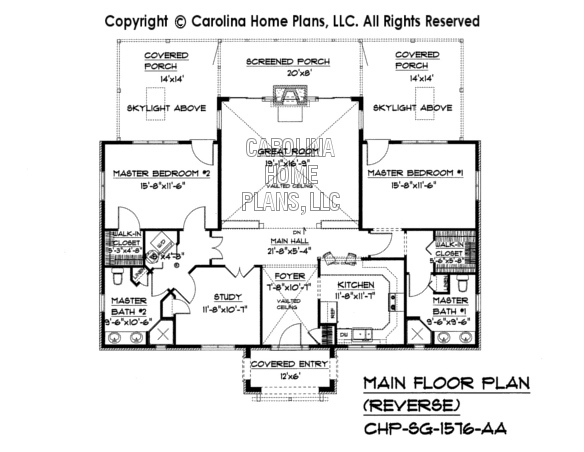 Each Master Bedroom has its own covered porch with access to the screened porch conveniently located off the Great Room. There is a small but functional main floor laundry and space for the hot water heater when building on a slab. 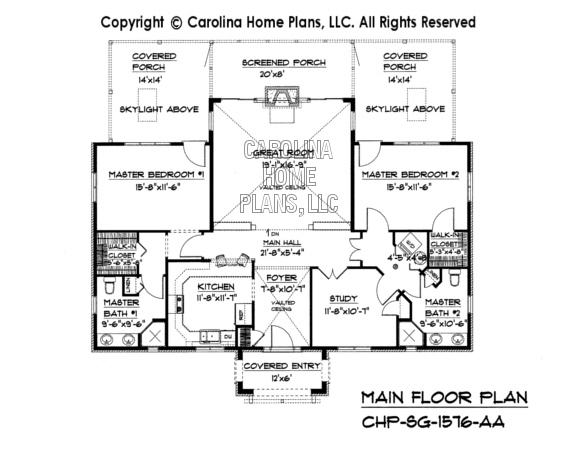 This efficient, well designed small open floor plan is great for entertaining and the small study is ideal for private away space or as a guest bedroom. 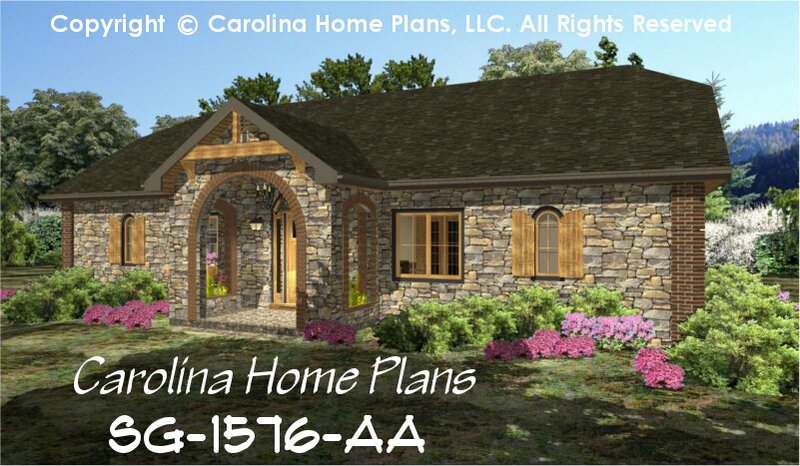 This 1-level small stone cottage house plan comes with crawl space or slab foundation. Available options and pricing: See below. This stunning contemporary cottage was originally designed several years ago as part of a marketing strategy for a major subdivision in Western North Carolina. 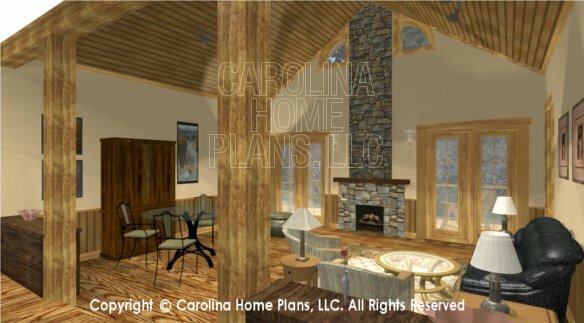 Plans for this "Sophisticated Rustic" series were presented to potential buyers seeking building lots for both vacation and year-round homes. In some cases model homes were constructed, however, with the availability of 3-d computer generated images most homes presold prior to breaking ground. This method of pre-selling prior to construction is more relevant now than ever. Ceiling Height 9', Grt Rm: 12'-9", Foyer: 11'-8"